Armadillo are an amazing group of animals that originated in South America. All armadillos have shells, made of true bone, that cover their backs. They have short, strong legs that are well suited to rapid digging, either for food or for shelter. There are twenty different species of armadillos. They belong to the order Xenarthra, family Dasypodidae. Many species of armadillo are endangered or threatened. Armadillos have moved as far west as Colorado and as far north as Nebraska, with occasional sightings even farther north. Cold weather will eventually stop the spread of the armadillo, as they cannot tolerate even relatively short periods of extreme cold - they do not have large fat reserves to help insulate their bodies. Armadillos have strong claws. They use them to help in digging, or to tear apart rotting wood to find food. Armadillos eat a wide variety of different foods, ranging from insects to plants. 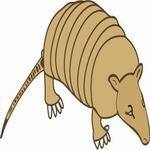 The beautiful armadillo scutes are from Heinze Cave, Jefferson County, Missouri. The nine-banded armadillo scutes are from a modern specimen from central Texas. Because small bugs and soft plants are not too difficult to chew, armadillos do not have very complicated teeth. They have lost all but their molars over time, and the teeth that remain are peg-shaped. Armadillo teeth do not have the hard white enamel coating that protects the teeth of other mammels. They rely on speed or their digging ability to escape danger.
. Most armadillos eat small invertebrates like ants, beetles, and grubs. Many of them also eat bits of flesh from dead animals when they can find them.